One of the places I disagree with a lot of GM advice I've read is the notion that using an established world is easier than building a world of your own. The thought goes that using a world already built, developed, and in place is easier because all that work is already done, and that building your own world is hard because, to quote the Angry GM whose advice I generally like: "a homebrew campaign setting is a great way to create a lot of work for yourself that your players will ignore and/or destroy." I disagree with this. I think if you're looking to save time, building a custom world can be just as easy - if not easier - than using an established world. Today, I want to talk about that, and maybe share some advice to help you get your next game going fast. As a warning, this is a bit of a lengthy post, but it has a lot of helpful links. The big reason why I disagree with the sentiment is because pre-made worlds have a lot of baggage. If you are running a game in Fae Run, your players will expect it to be in the same Fae Run they read about when reading Forgotten Realms books or reading book adventures. Now, you can change this - and the advice often does say to do that - but once you start modifying a world you are world building. Also you need to communicate these changes to your players, and that means you are going to have clashes from expectations that can cause disruption to the game. These disruptions can be problematic depending on knowledge of the world. I love Legend of the Five Rings. I have GM'd L5R in 2nd, 3rd, 3.5, and 4th editions. I was the head GM for an online game of 200+ players with a GM team of 15+ GMs. I have run, and played, in more games of L5R then I can count, and it accounts for the majority of my last 10 years or more of RPG playing. So this might surprise you: I don't know a damn thing about Rokugan as a world. I know the basic culture of L5R. I know how the clans work in general. I know that there is a capital city called Otosan Uchi and another one named Toshi Ranbo. But that's it. 10+ years of GMing in this world, and I couldn't tell you anything about it aside from there are 2 capital cities and the names of those cities. Now this may seem counter to my above point, but here's the thing. Was I really running my L5R games in Rokugan? Or was I just using the name? Most of my games took place in fictional cities/castles I made for the game. They were in Rokugan, but they were in Rokugan in places that may have been impossible by the map. And it did cause conflicts in the games until players remembered/were told that we weren't paying any homage to canon Rokugan. On the other hand, if you tell people they're in a custom built world or a home brew setting, you are free of those trappings. There are no expectations of running into Drizzt Do'Urden up in Icewind Dale. There is no thoughts that because you're 6 months before A New Hope and on Tattooine that you can go and talk to Uncle Owen. There is no expectation that that city is secretly run by demons. You have a blank slate. You're free to go where you want and do as you please. But what about all that work that the Angry GM referenced, and that other people think comes with it? Well, you can approach that the same way you approach everything when you're doing GM prep on a limited time budget. You get lazy about it. Bill Gates has a famous quote where he claims he likes to give complex jobs to lazy people, because they'll find the easiest solution to the problem. Amusingly enough, there is a book called "The Lazy DM" that is about doing game prep the easiest/laziest way to still have a fun game. It has a lot of good advice along with some - like the bit about using pre-built worlds - that I don't. But it is a great book so far. Now the first law of the Lazy GM is this: prepare only what most benefits your game. Or, as I tend to remember it. Prepare only what you need. Do you need a whole world with 800 years of history, political intrigue, twelve kingdoms with royal lines, wars, dragons, myths, and custom gods? No. No you don't. Hell, you don't even need a map. To start a game all you need is a location and some setting dressing such as time of the year. You can get everything you need out of a setting to start your game with a single sentence and a random name generator for buildings your PCs want to go into. The trade town of Hogsfeet, just off the King's Highway in the beginning of spring. The remote lumber town of Dornwich in the dead of winter, where they're so far from civilization they haven't seen a tax payer in years. The fishing town of Sherfield, mid-summer during the storm season. The walled city of Swordbreak, late autumn and preparing for winter. And that's it. That's all you need to start doing the rest of your adventure prep. Heck, you can do the adventure prep first and let it tell you what you need for a setting. Want to attack with fish-men? You probably want a coastal town. Goblins overrunning a town? Anywhere will do, but somewhere remote is better. Oh, and all those town names? I didn't noodle them.I just pulled them from fantasynamegenerators.com. Say you want maps. That's easy too. First, the internet is full of world maps you can use for your home game. If it is a private home game, there's no real foul is using anyone's maps. People post their maps on reddit all over. /r/fantasymaps is specifically geared towards sharing fantasy maps. There are also places like the Cartographer's Guild. Or you can just do a Google or Bing search for "Fantasy World Map". You want to build your own custom map? 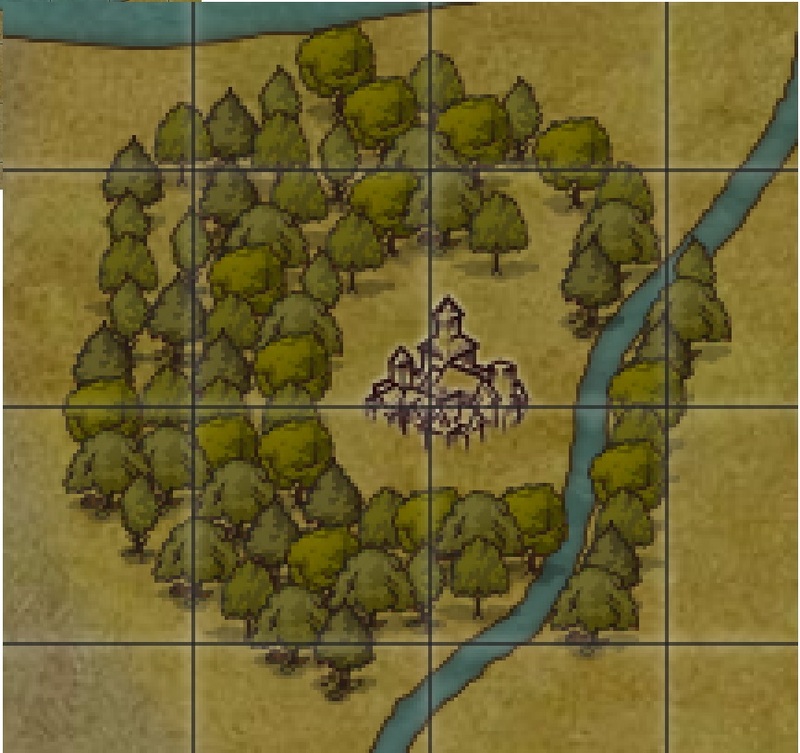 Inkarnate is free to sign up for, easy to understand, and quick to use. 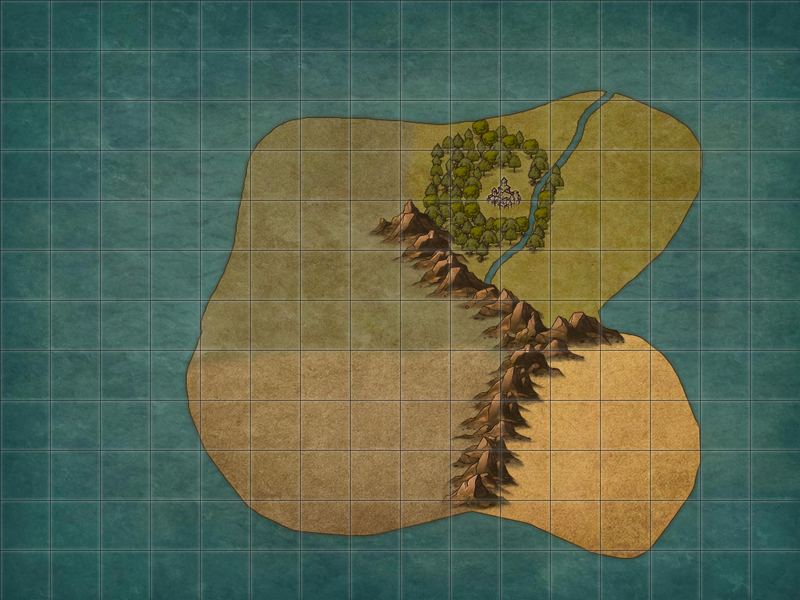 There are other free map generators. There are also relatively cheap ones like Wonderdraft which can procedurally generate continents (though you have to add the terrain). Just remember, there is no need to build the whole map. Just build what you need, and develop the rest as you need it. 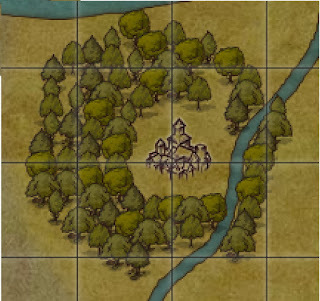 For example, I did this in less than 10 minutes using Inkarnate, including signing up and reading through how the tools work. Now that's not a lot of map, but it shows the area the first session or so will be in. From the section above that could easily be Dornwich the lumber town, far from other cities and help. There is a river nearby, and the place is surrounded by woods. Which means we have lots of room for places potential adventure fodder could come from. Do you need a city map? If you do, check out this city map generator. It doesn't work great for small towns, but for cities it works wonderfully and has options to add/remove walls, coasts, rivers, and other features. But that is all you need. If you're doing "lazy prep" then why do work you don't need? You don't need a huge history, you just need the bits of history you need for that part of a specific adventure or thing. You don't need the layout of cities, towns, and other features. You just plant them as you need them. You don't need to adhere to the strict rules of geography and how worlds form, this is a fantasy world with magic. So when it comes down to it, which do you think is easier? Reading the whole Forgotten Realms wiki for all the information on Faerun you need to run a game there? Or just telling your PCs they find themselves in the remote town of Dornwich, a logging town just a few miles off a river, that hasn't seen a tax collector in years? What many GMs fail to take advantage of is that they have a number of other creative self-interested minds involved with the process: the players. I will play in pre-made settings or in a generic setting, and I work with my players to fill in details. It's quite true that players will ignore, forget or dislike most stuff the GM comes up with, so I try to make sure that the players are involved in the process. I avoid having us create anything that isn't immediately relevant and anything we create is true, no matter what might be written in a book somewhere. I've had much more success with this than with anything I've tried to premake. Yeah, that is one of the other advantages to doing lazy world design. You get to put things down the players are interested in, or even come up with for themselves. I also like how FATE does world building in games like Dresden Files where the key locations are made by the players, not the GM. If the GM puts down a bar, it's just a GM bar. A player puts one down though, and they're interested in seeing what happens with it.